Maltipoos are a mix between a toy poodle and a purebred Maltese. Maltipoos (aka Maltepoos, Malti-poos, and Maltidoodles) and mini Maltipoos are a mix of a mini Poodle (or toy Poodle) and a purebred Maltese. Maltipoo puppies are usually great with children; they seldom meet a stranger, and they absolutely love being with people. Maltipoos are known for being playful, funny, cute, and loving to snuggle and cuddle with their forever family. At Crockett Doodles, we plan and prepare to add one new doodle breed each new year. Maltipoos are the newest, and we anticipate the first litters going to homes in mid-2019. 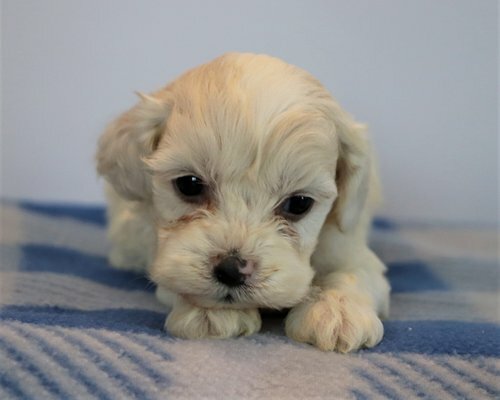 Because Maltipoos are one of our newest breeds, you can anticipate a longer wait for a Maltipoo puppy (likely 5-10 months) compared to other doodle breeds that we have been breeding for years (average 1-3 month wait for most of our breeds). White Maltipoos look a lot like a purebred Maltese; they have the added advantage of a curlier coat, hybrid vigor, and poodle smarts. Apricot Maltipoos are also very popular. Blenheim Maltipoos (white base with red or apricot patches) are adorable. We also breed red Maltipoos (people’s overall favorite) or red/white Maltipoos. Often these red Maltipoos with white tuxedo markings are gorgeous. Any other Maltipoo color pattern (caramel, chocolate, black/white, etc) than those mentioned above would be a $1400 Maltipoo adoption fee.